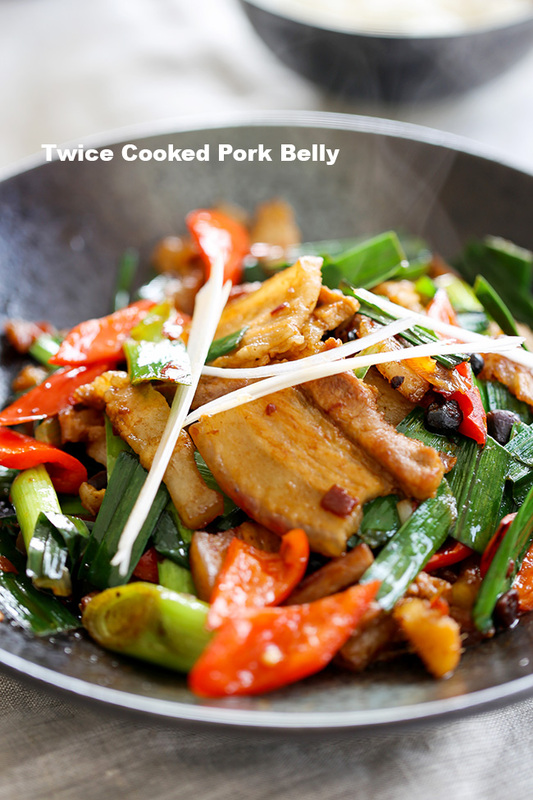 Twice Cooked Pork (回锅肉 Huí Guō Ròu, in Chinese language) or Double Cooked Pork Belly is one of the most famous dishes of Szechuan pork recipes. There is an interesting saying that if you do not eat Twice Cooked Pork, then you have never been to Sichuan. The English name is literally translated from Chinese name “回锅肉” which means “back-in-the-pot-meat”, and the Chinese name comes from its cooking process: “回” means returning. Twice-cooked pork means that the pork should be cooked twice. 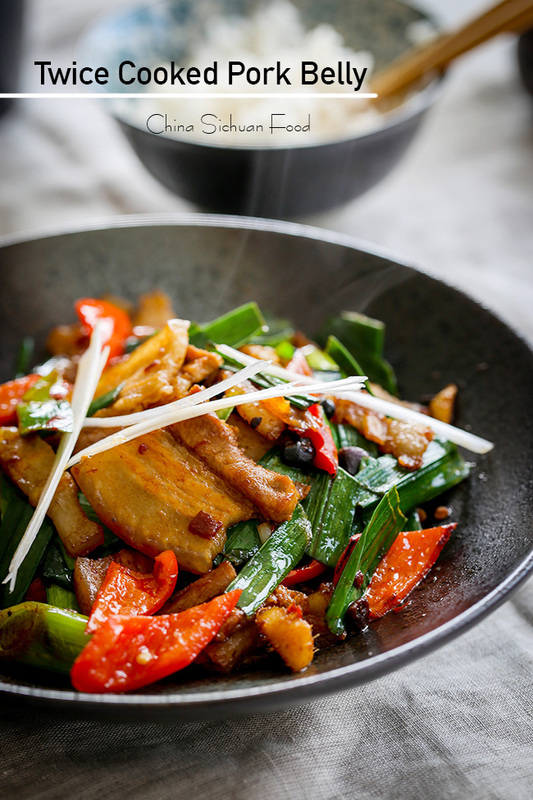 Firstly pork is boiled in water until nearly cooked, then use Dou Ban Jiang (豆瓣酱, also known as broad bean paste), fermented black soy beans (豆豉 Dòu Chǐ), ginger, garlic and side ingredients to stir-fry for flavoring. How to identify when the pork is nearly cooked? Here is my tip: use one chopstick to poke the pork from one side to another side to see whether the chopstick meets tough resistance. If there is only small resistance but you can pork the chopstick from one side to another side, then stop boiling and enter the next process. Usually, the boiling process costs 30 minutes for me. There are several varieties of Twice Cooked Pork. Most of the difference lies in the side ingredients. Some use cabbage or potatoes. But the most popular one in China is garlic sprouts (蒜苗 Suàn Miáo). 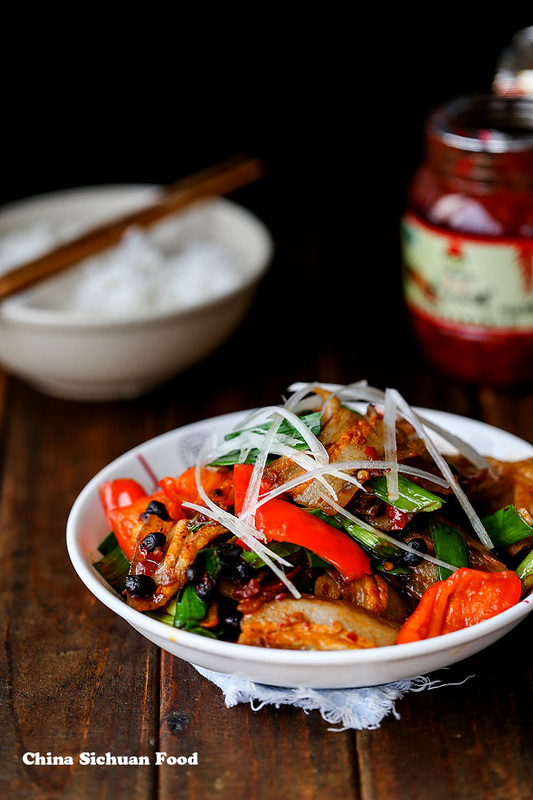 Since dish color is commonly be considered as one of the five factors in Chinese cooking philosophy, red peppers are always used together, which contributes a beautifully appearance to improve your appetizer. Ok, this’s a picture of garlic sprouts. 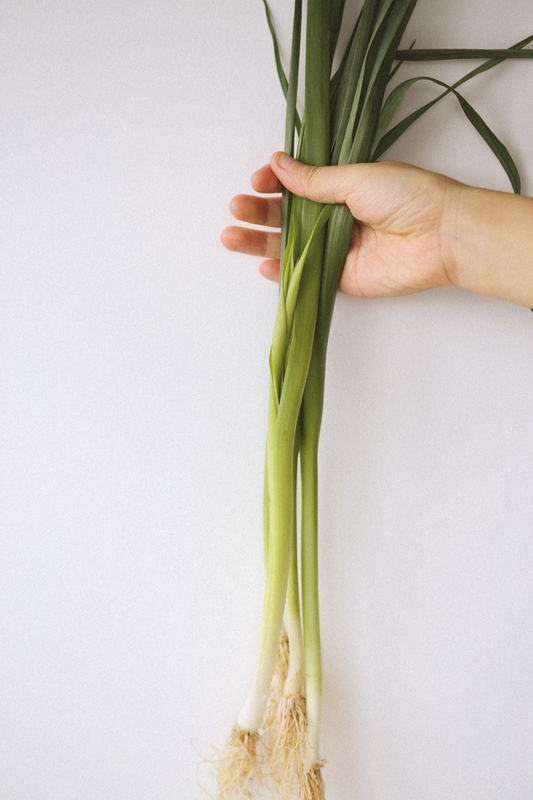 If you can not get some, maybe leek can replace it. By the way, it is quite easy to grown your own garlic sprouts at home. There are two popular eating methods of Twice Cooked Pork, one is to match with steamed rice and the other one is to insert the pork into Guo Kui (锅盔) which is a type of Baked Chinese bread. In Szechuan area of China, people use sweet bean paste (甜面酱 Tián Miàn Jiàng) instead of soy sauce for Twice Cooked Pork. But sweet bean paste is quite hard to find outside China. Soy sauce twice cooked pork belly is good enough for most families. Besides, the thickness of the slices will influence the taste slightly. Yes, I mean it. If you cut the pork slices into thicker one around 0.3-0.4 cm, the pork slices will be slightly softer. While if your pork slice is 0.1cm to 0.2cm, they may slightly chewer. Picture below is a thicker version loved by me daughter and the video shows a thinner version loved by my friend. 1.Place pork belly in a large pot with enough cold water to cover. Add 1 green onion and 4-5 Sichuan peppercorn seeds. Bring to boil and simmer for 30 minutes. If you are cooking a larger amount, cut the pork belly into sections around 15 cm long (keeping note 1), transfer out and set aside to cool down. 2.Smash the head of garlic sprouts and then cut the head part and leaves into 1.5 inch sections. Remove the seeds of red pepper and cut into pieces too. 3.Heat up around 1 teaspoon of oil in wok (not too much, otherwise the dish might be over greasy), fry the pork belly for around 1-2 minutes (Note 2) until they begin to loose oil and slightly brown. 4.Move the pork slices out and leave oil only, fry ginger, garlic and scallion until aroma. Place dou ban jiang and dou chi, fry for another half minute. 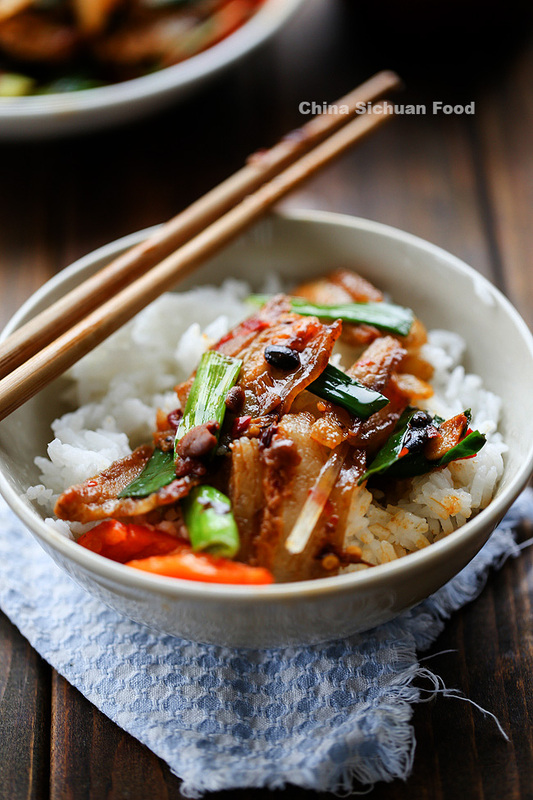 Return pork slices and give a big stir fry to combine well. 5.Add red pepper, fry for another half minutes. Lastly, place garlic spouts and light soy sauce. Combine well and transfer out immediately. You can boil a larger amount, for example, 600g once and keep the rest half for another stir frying in following 2 days. Cool down completely and keep in refrigerator, covered with plastic wrapper. If the pork belly is fatty, frying for a longer time can reduce the oil it contained. However if the pork belly is with lots of lean meat, do not over-fry it. Otherwise, the slices will dry out. Best Grill House in London!